How often do you sit down with a great bowl of pasta and a fine glass of wine and know precisely what you’re eating? Knowing where your food comes from and exactly what’s in it is a luxury that’s largely been wiped out by mass production. 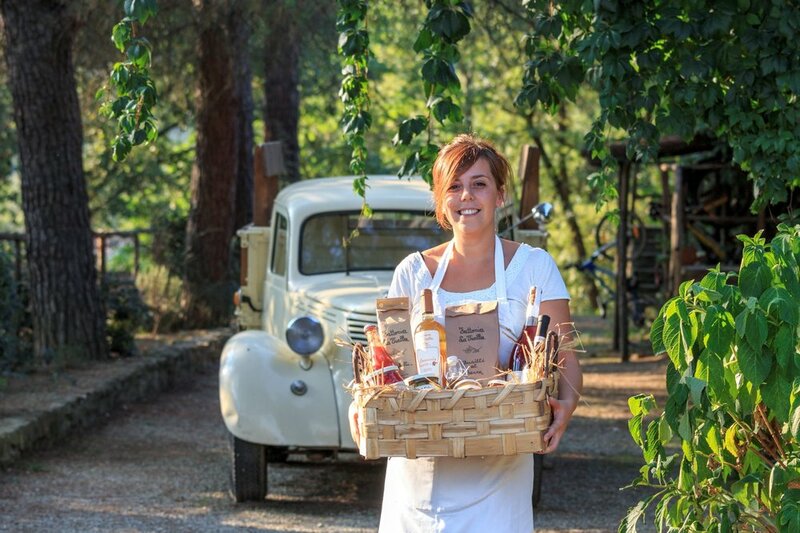 Fattoria La Vialla offers a (wonderful) way back to products and ingredients that are big on taste, small on waste and come from an ethical, family-run company. This farm and wine estate in the Chianti area of Tuscany is run by three brothers, Antonio, Bandino and Gianni Lo Franco. Fattoria La Vialla is a role model for biodynamic farming on a large scale: its 1,600 hectares are home to vineyards, olive groves, vegetable gardens and pastures, as well as crop fields. Around half of the site is preserved as forest that helps to offset the farm’s already low CO2 output, making La Vialla carbon neutral. As a pioneering enterprise that marries sustainability with preserving cultural heritage, the farm is a focus for various university research projects. Ethical credentials, however, do not a nice bowl of pasta make. Luckily, the proof of La Vialla’s methods is in the tasting. You can buy La Vialla’s wines, sauces, pasta, extra virgin olive oil, pecorino cheese and honey online direct from the farm. Wines are low in sulphites; sauces have few ingredients and no added preservatives, and its oils, vinegars and pastas are reassuringly – and deliciously – rustic. To find out more, visit lavialla.it/uk. Now, La Vialla is offering readers of The Simple Things the chance to win one of their hampers, chock full of delicious organic Tuscan food and drink. The competition is online at thesimplethings.com/blog/lavialla. In the interests of fairness, next month’s playlist is Songs About Dogs. Do you have a favourite? Tell us on Facebook, @thesimplethingsmag, and it might be included next time. Here’s a little brainteaser for Easter. Five children won Golden Tickets to visit Willy Wonka’s chocolate factory in Roald Dahl’s Charlie and the Chocolate Factory. But can you match the child to their fate in the plot? Scroll down for the solution. e) Is shrunk by a miniaturisation machine and then stretched back in the gum stretching room, but leaves the factory 10 feet tall. In our April issue, our Outing feature is all about chocolate. 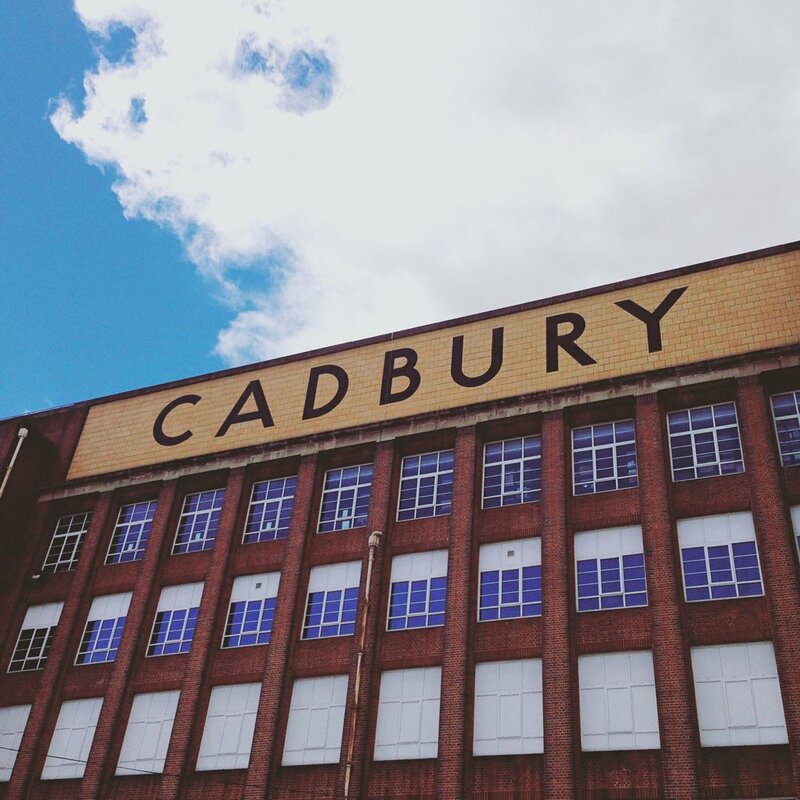 While you sadly can’t visit Willy Wonka’s chocolate factory yourself, you can visit the Cadbury factory (pictured above) that inspired Dahl. Just don’t go drinking from the chocolate river. Ever sniffed the air in a good bakery and been transported instantly back to sitting by your grandmother’s Aga? Or walked into a primary school and found the smell of utilitarian floors and Dettol made you feel six again? It’s really more surprising if this hasn’t happened to you, as smell is the most evocative of all our senses. Because our language is not so rich in words to describe smells as it is sights or sounds, they are harder to pinpoint and describe but smells work more efficiently with our brains to evoke memories than anything we see or hear. The US journal Cerebral Cortex found that the reason for this is that our brains log smells away in the area used for storing long-term memories. In fact, we are able to recall twice as many memories when they are associated with a smell as when they aren’t. And it’s true, smell can evoke very negative memory responses too. The scent of an ex-boyfriend’s brand of aftershave might make you feel heartbroken (or just furious) all over again, 20 years after he dumped you for Carol with the bad perm. Whether smells take you back to happy times or upsetting ones, we’ve been fascinated this month by what smells evoke strong nostalgic responses in you. The Simple Things staff listed everything from specific brands of shampoo, to cut grass to horse manure among theirs! We’d love you to share yours with us in the comments below, too. If you’d like to learn more about the power of scent, in our April issue, our ‘Know a Thing or Two’ feature is all about essential oils. It’s in the shops now. Just don’t go down the bakery aisle while you’re there or who knows what you’ll come back with. Freshly baked apple puff, anyone? Ramsons, or wild garlic, makes for easy foraging. Around now, damp woodland becomes carpeted in bright green leaves, the air heavy with its savoury aroma. If you can’t find any wild garlic, you can replace it with watercress, young nettles (wear gloves when harvesting – the sting will go when cooked! ), spinach, kale or chard. 1 Melt the butter in a large saucepan over a medium heat. When foaming, add the potatoes and onion, and toss in the butter until well coated, then season with salt and pepper. Turn the heat down, cover the pan and cook for 10 mins or until vegetables are soft, stirring regularly so that the vegetables don’t stick and burn. 2 Next, add stock and bring to a rolling boil, then add the wild garlic leaves and cook for 2 mins or until the leaves have wilted. Don’t overcook or it will lose its fresh green colour and flavour. 3 Immediately pour into a blender and blitz until smooth, then return to the clean pan, stir in the cream and taste for seasoning. 4 Serve hot with crusty bread. COOK’S NOTE: Harvest garlic leaves between March and May before the plant flowers. Be mindful and pick a little here and there. Wild garlic looks similar to the poisonous lily of the valley so always crush the leaves and check for the smell of garlic before picking. Recipe from Recipes From My Mother by Rachel Allen (Harper Collins). If you’ve got a lust for something green and pungent after that you won’t want to miss the start of our new foraging series, Finders Keepers, by Lia Leendertz (first part in our April issue, in shops now). Foraged crops are free, abundant and flavourful. All you need do is get yourself to a good spot at the right time, basket and secateurs in hand, and you have some of the best crops available. Through the foraging seasons of spring, summer and autumn, we’ll show you where to find these crops, how to pick them, and ways to turn them into delicious dishes. This month’s pages include a fabulous recipe for wild garlic, nettle and broad bean frittata that has already gone in our best recipes notebook. This simple project can be done in an hour and you’ll have cherry tomatoes dangling temptingly by the back door ready for salads all summer long. We recommend you make lots and hang them together in bunches. Green plastic bottles look most attractive if you have them but any will do. 1 Clean your plastic bottles, removing any labels. Carefully cut away the bottom of the bottle. 2 Seal over the jagged edge with masking tape; then, using the hole punch, make four holes in the tape, one on each side of the bottle. 3 With the mouth of the bottle facing down, insert your tomato seedling and carefully work the plant into the mouth. Then spread the root ball out inside the bottle. 4 Fill the bottle three-quarters full with compost. 5 Thread your twine through the holes and tie securely together. 6 Hang somewhere sunny and water really regularly. You can take your Canaries and your private Caribbean islands; they’re nice if you just want sun sea and sand. And much as we love some wild wilderness, you can keep your Hebrides and your Orkneys; lovely for a bit of alone time and drama, but a bit, well, unfestive for a jolly holiday. But the Isle of Wight is hard to beat. As a holiday resort, he island has come in for some criticism in recent years. Perhaps poshos indulge it for Cowes Week, but its seaside proms, amusements and crazy golf courses might be seen as a little infra dig in some circles. We say hurrah to that - more jolly Isle of Wight fun for us, and they’re missing the best of the island. There can’t be many places that you can visit as a child and return 30-odd years later to find nothing has changed - in a good way. But the island is one of them. In some of the chocolate box villages, you could be walking into the 1950s. 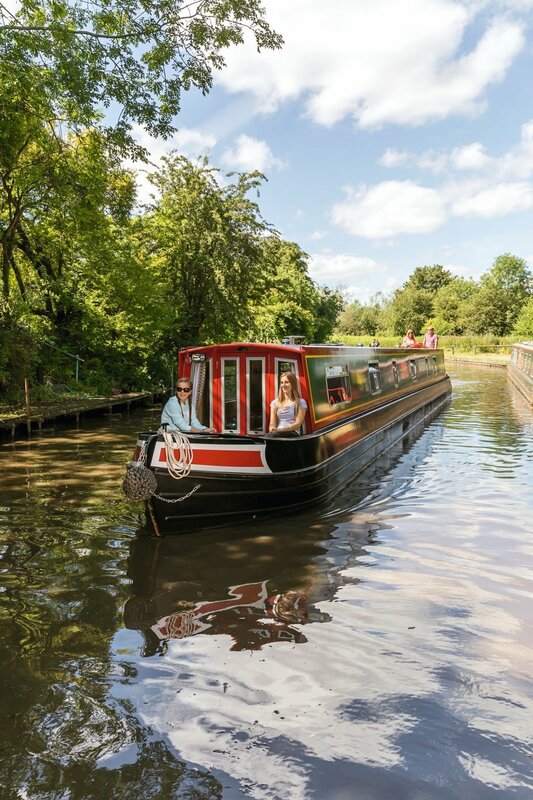 It also has some of the best of the UK’s beaches, rolling countryside and top-notch eateries. And the best thing about it is that wherever you happen to visit that morning, if you tire of it you can simply jump in the car - or on the wonderful train line serviced by ex-London Underground cars dating back to 1938, and rocket across the island to a different venue. No, wait - the very best thing about it is that you get to go on a ferry ride, making it feel like you are truly leaving real life behind and jetting off to foreign climes… and yet it only takes about 45 minutes. In our April issue our ‘My Neighbourhood’ feature takes us on a tour of the Isle of Wight and it had us all just itching to jump onto a Red Funnel ferry immediately and be pouring coloured sand into glass lighthouses and eating fish and chips by an open fire by lunchtime. So we’ve been thinking about famous fictitious journeys to the Isle of Wight. Here’s our round-up of our favourites. The couple in ‘When I’m Sixty-Four’ by The Beatles. In this whimsical imagining of how a relationship would pan out years from the present, the singer hopes: ‘Every summer we can rent a cottage in the Isle of Wight, if it's not too dear… We shall scrimp and save.’ Well. Don’t go in Cowes Week, but off peak, you should be fine. Vera, Chuck and Dave (the grandchildren on their knee) might have to stay behind if it’s school term time, though. Sadly, The Fab Four never actually crossed the Solent together to play, but we think of the Isle of Wight as a very Beatles place to have a jolly still. In the second part of this tripartite novel, Martha is employed by Sir Jack Pitman who wants to turn the Isle of Wight into a huge theme park called England England, which replicates all of the country’s best known historical buildings, sites and people, to save tourists the bother of traipsing around the whole of England itself. Genius. Both were filmed at Osborne House on the island. Perhaps no great surprise since Osborne House was summer home to Queen Victoria for the last 50 years of her reign. But she had a lovely time apparently. Loved the crazy gold at Shanklin. Saving our favourite IOW appearance for last… Day of the Triffids. In the John Wyndham 1950s Sci-Fi novel, the characters flee the mainland and set up a new colony on the island, safe from the ravages of the giant man-eating plants. The island is actually a real-life safe haven for unusual flora and fauna today, from the red squirrel and Granville Fritillary butterfly to narrow-leaved lungwort and Early Gentian. Just don’t pick the flowers - they might bite back! For more on the Isle of Wight buy our April issue, in shops now. Cheesy scones. With cheese… What? This is fine. We’re big fans of a Ploughman’s Lunch here at The Simple Things. And, while you might think the story of The Ploughman’s would be something of a pastoral, in fact it’s something more prosaic altogether. Of course, farming types have been slinging a cloth filled with bread, a hunk of cheese and an apple in their bags for centuries. But it was The Cheese Bureau which first germinated the idea. The Bureau wrote in its monthly bulletin in 1956 that it “exists for the admirable purpose of popularising cheese and, as a corollary, the public house lunch of bread, beer, cheese and pickle. This traditional combination was broken by rationing; the Cheese Bureau hopes, by demonstrating the natural affinity of the two parties, to effect a remarriage”. To be honest, we’re just thrilled to hear there is such a thing as The Cheese Bureau and we’re wondering if we can arrange some work experience with them… We digress. The Cheese Bureau clearly made sterling efforts to put the component part of a Ploughman’s back on the pub table. But it was The Milk Marketing Board which picked up the idea in the 1960s and ran with it, coining the phrase ‘Ploughman’s Lunch’ to describe this combination of bread, cheese, apple (and, one hopes, a huge brown pickled onion and a stick of crunchy celery). The Ploughman’s Lunch was hoped to boost the sale of cheese, particularly through pubs and it worked a treat. We’re still eating Ploughman’s Lunches with gusto half a century later. So, in the spirit of entrepeneurship, in our April issue’s Gathering, we have this jolly little recipe for Ploughman’s Scones. We recommend you serve them stuffed with cheese and chutney alongside an apple and a pickled onion or two. The Ploughman’s Scones are part of our Any-Time Tea Party feature by Catherine Frawley, which also includes recipes for Hot Cross Bun Loaf, Mini Egg Rocky Road, Mini Victoria Sponges and Marshmallow Pops. Make it for an Easter treat or just, you know, any time. The recipes are in our April issue, which is in the shops now. 1 Preheat oven to 200C/Fan 180C/ Gas 6 and line a baking sheet with baking parchment. 2 Sift the flour, baking power and a pinch of salt into a bowl. Add the butter and rub with your fingertips until you have a breadcrumb mixture. 3 Gently mix in 100g grated cheese, make a well in the centre, then pour in the milk slowly, mixing until you have a soft but firm dough. 4 Dust the work surface with flour and roll the dough to about 2cm thick. Using a 5cm cutter, cut out your scones, re-rolling and cutting the remaining dough, until it’s all used. 5 Place the scones on the baking tray, brush with milk and sprinkle with the remaining grated cheese. Bake for 12–15 mins or until golden brown. Leave to cool on a rack, then serve with slices of cheddar and pickle. You'll know all about wild, foraged foods if you've leafed through the latest edition of The Simple Things. In fact, if you hold your ear close to Abel & Cole’s wild coastal mix, you just might hear the lapping of the waves. This seasonal selection of freshly-foraged greens are the perfect accompaniment to a crab spaghetti, rustled up in double-quick time. This supper is like the seaside on a plate, starring a mix of wild foraged sea veg – including samphire, all gathered specially for us – which go swimmingly with sweet Cornish crab, stirred into a buttery pasta sauce with a pinch of chilli heat. 1. Put a large pan of water on to boil. Give the sea veg a good wash. Peel and finely chop the garlic cloves. Finely grate the zest from the lemon. Pick the parsley leaves from their stalk and roughly chop them (discard the stalks or keep them to go in your stockpot). 2. When the water in the pan is boiling, add the sea veg. Simmer for 3 mins, then scoop them out of the water and pop them aside in a colander to cool for a min. (See our tip for what to do with each type of veg, once it’s cool enough to handle.) Set the prepped sea veg to one side. 3. Bring the water back to the boil and add the spaghetti. Simmer for 8 mins till the spaghetti is tender but still with some bite. 4. While the spaghetti simmers, put a deep frying pan on a medium heat for 2 mins, then add the butter and swirl it round the pan till it’s melted. Add the garlic and a pinch or 2 of the chilli flakes (they’re hot, so use as large or little a pinch as you like). Fry, stirring, for 30 secs till the garlic is golden. 5. Flake the crab meat into the pan. Crack in a little black pepper and fry, stirring, for 3 mins. Then add the sea veg and the lemon zest to the pan. Fry, stirring for another 2 mins. 6. The spaghetti should be ready by now. Scoop 1 cup of water out of the pan (mind your fingers). Drain the spaghetti, then add it to the frying pan with the crab. Add around 50ml of the pasta water then toss to mix everything together. 7. Divide the crab spaghetti between 2 warm plates. Serve with handfuls of the watercress on the side, drizzled with 1 tbsp balsamic vinegar. The daddy of fictional frogs - Beatrix Potter’s dear little amphibian who wore a read coat (a frog coat presumably) and had a near miss with a trout while catching minnows for a dinner party to which he’d invited his good chums Isaac Newton (a newt) and Mr Alderman Ptolemy Tortoise. This muppet must be the most famous of all frogs worldwide. With his endearingly skinny legs and rubbery mouth, he lives a much more ‘Hollywood’ life than most of his fellow fictional frogs. But as he’s often said, it’s not easy being green. He uses his fame to good ends though. Here he is taking the ice bucket challenge [https://www.youtube.com/watch?v=Mmax3yEZX58] in 2014. The tale dates back to Roman times but the best known version is by The Brothers Grimm and tells the story of a princess whose ball is rescued from a well by a frog on the promise that he can be her constant companion. Against her better judgement she is forced by her father to hold good on her promise, but loses her temper with the frog and hurls him against a wall. Whereupon he turns into a prince and they live happily ever after. Note the lack of a kiss in this story; all that schmaltzy nonsense was added much later. A recent entry but this is one frog sure to become a classic. The first in a series of rhyming books by Kes Grey and Jim Field features a bossy cat who tells Frog he must sit on a log because frogs sit on logs. He can’t sit on a stool (mules sit on stools), he can’t sit on a sofa (gophers sit on sofas) and so on. 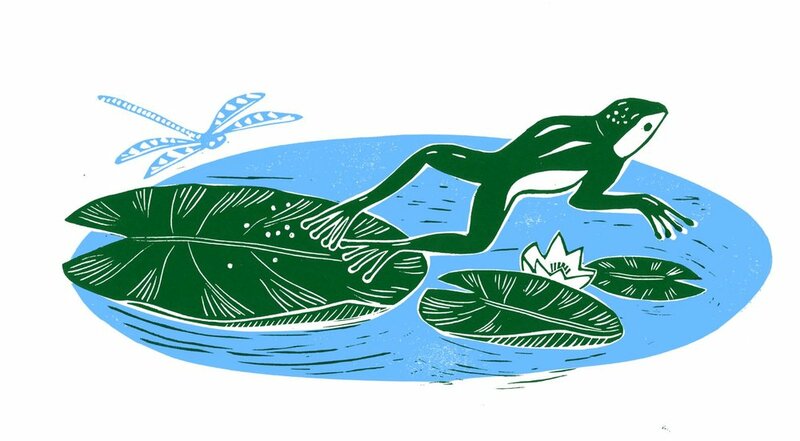 Frog objects to sitting on a log (“They’re all knobbly and give you splinters in your bottom”) but Frog’s day gets worse when he asks what dogs sit on… (no spoilers here but it’s a heck of an ending).